Yesterday, I showed some of the mishaps from making melt & pour soap with embedded soap pieces. 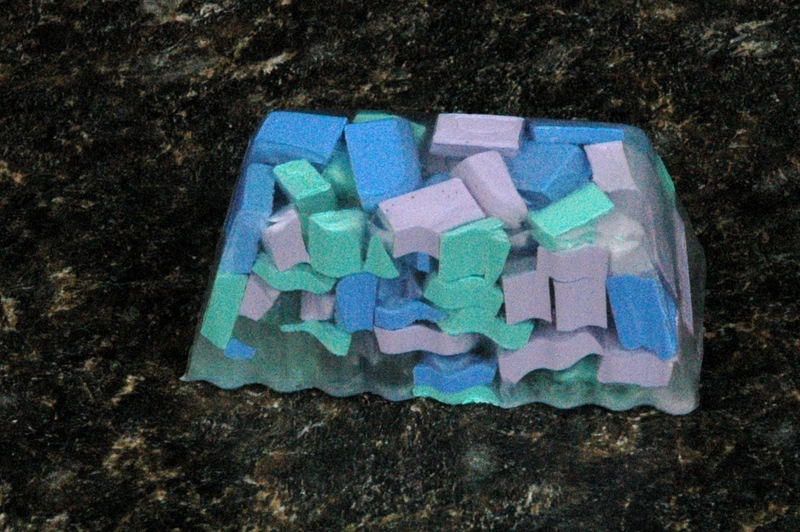 How do we prevent the soap pieces from being melted by the soap we pour over the pieces? How do we have clear defined objects in our soaps? 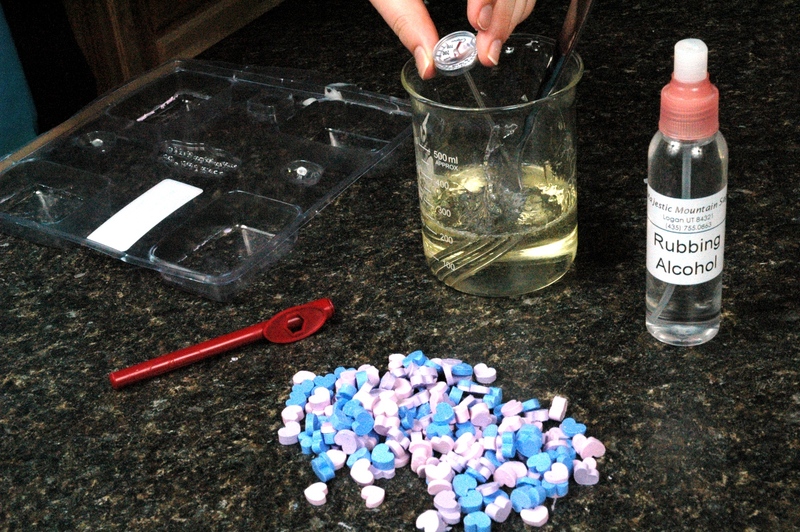 Today, I will show you how to pour your soap and not melt the soap chunks you want to embed in your soap! Normally, I melt my Transparent soap until everything is melted and the soap is fairly hot. However, pouring my soap as hot as I normally have it, is not beneficial to embedding soap chunks in the soap. To have an appropriate temperature for pouring over the soap to be embedded, melt your Transparent soap until you have a few large chunks of soap that are not yet melted. 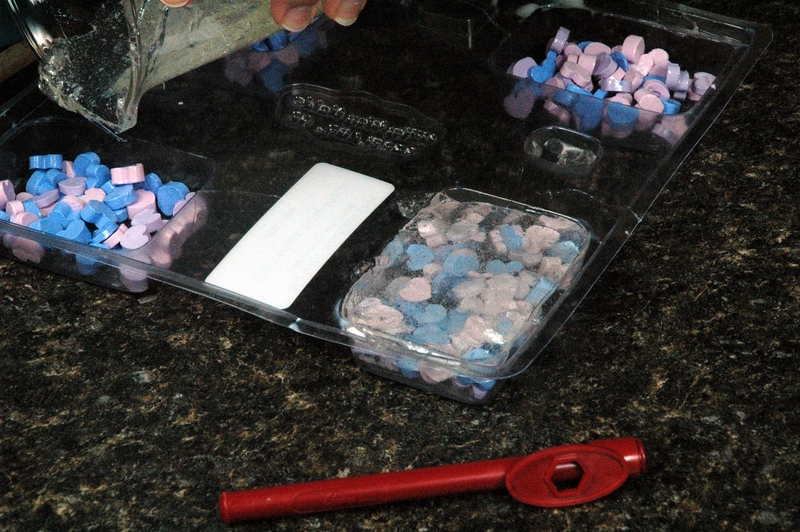 Use the spoon and stir the Transparent soap until all of the chunks are melted. You can add fragrance at this point if you desire. You want your soap to have a slight viscosity to it, about the same viscosity of a slightly thinned rubber cement. The temperature should be between 115 and 125 degrees Fahrenheit (46.11 to 51.67 degrees Celsius). 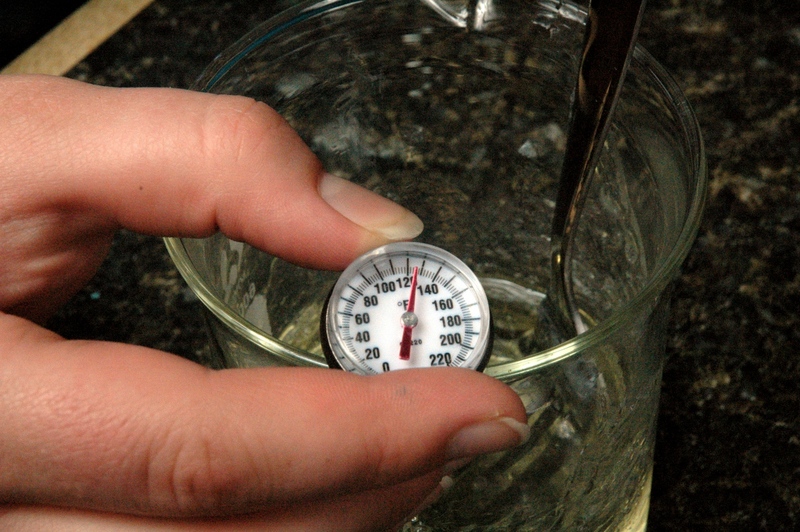 Once your soap to pour over has reached this temperature range, you are ready to pour. 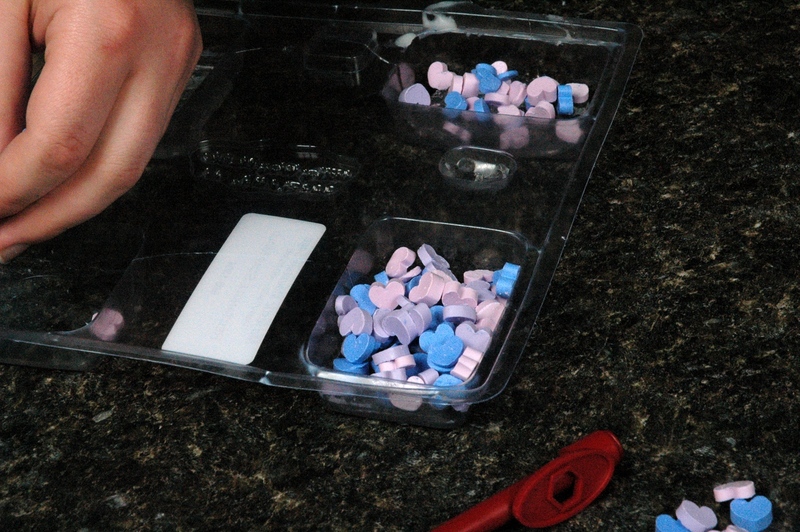 Spray your chunks to be embedded with the alcohol and gently pour your Transparent soap over the chunks. Once the mold has been filled with soap, spray the top of the soap with alcohol to help prevent a skin from forming and the bubbles to pop. Now you can make any final adjustments to your chunks. Allow your soap to cool until it is completely solid. Remove from the mold and enjoy your beautiful soap! Filling the molds with chunks. 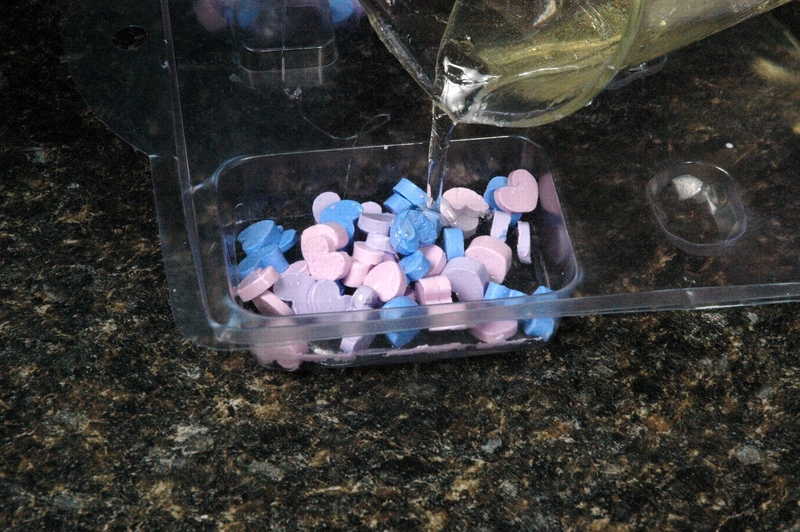 Pouring soap over the chunks. This is similar to what our finished soap will look like. I have an oops with a soap I made recently. I used a recipe for soap with pepermint leaves & spearment & peppermint essential oils. It was a Soap scrub recipe on the MMS website. I used Shea Butter M&P soap with the crushed leaves and essential oils. I also added pumice to the mix right before I poured into the mold. When cooled, I cut the soap and placed in bags. A week later the soap has rust color marks all over. What happened? And is there any way to fixed this? Thanks for your help. These rust color marks are the botanicals turning brown. I would recommend checking out the Cold Process Soap, Day Five and look at the pictures of the cut soap from Day Four. You will have to look at the pictures following the text. I think this is very similar to what you are seeing. This is normal, and unfortunately, there is nothing you can do to stop it. Enjoy your soap and firmly believe that the botanicals took artistic license with your soap! That is exactly what it looks like. I thought I have done something wrong with the recipe. I had made these for gifts, but they do not look pretty. Thanks for the information. Give the soaps away anyway. Pretty is perspective. This is where we get one man’s trash is another man’s treasure. While I don’t personally like all the botanical soaps I ahve seen, others are really neat. I do like the look of peppermint leaves turning brown. I don’t like the look of whole rose petals turning black. I am sure that true friends will be appreciative of your efforts to make a nice gift, and it IS a nice gift.